AMTK 642, the Veterans ACS-64, leads train 173 to its stop at Kingston Station about 5 minutes early, as usual. I was told by 2 different Amtrak people several weeks ago that train 173 would run once a week on track 3 to keep the rust off the rails, as it has the most padding in its RI schedule (departs Kingston 25 minutes after leaving Providence, vs. 20 or 21 minutes for other regional trains). After venturing to the station for the last 14 editions of 173 (and 15 of 16), I have not seen it on track 3. Even with extra rust on the rails Monday (and the perfect locomotive for track 3 photos), 173 ran west on track 1 again. So much for 'inside information'. 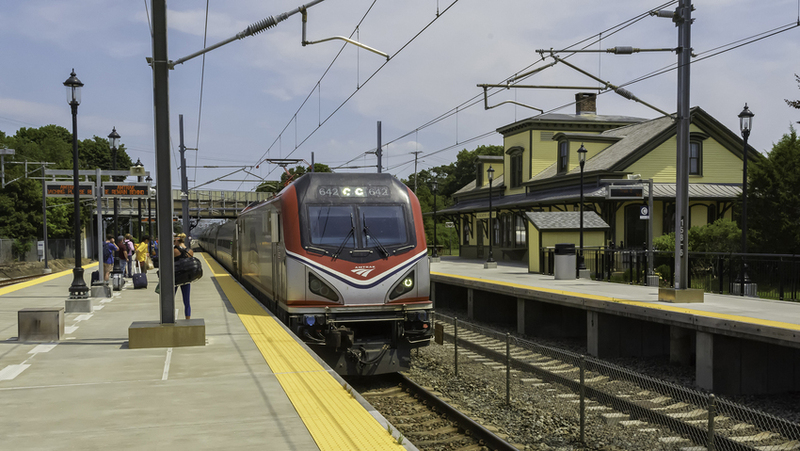 Track 3 has been used a few times; an initial run by 173 several weeks ago and once by 171 to clear an Acela when track 2 was closed for track work. Photographed by Warren Beckwith, August 6, 2018. Added to the photo archive by Warren Beckwith, August 7, 2018.